Don’t tell anyone—but the wild child isn’t all that wild. Sure, Justin Barcia is all about the revving and the scrubbing, and he’s going to bam-bam into the other riders as quickly as possible. But, for a wild man, he’s pretty consistent. Wild means crashes, wild means win one week and DNF the next. Wild, in the tradition of win-or-crashers like Magoo, Bradshaw or even, yes, James Stewart, means the only person that can beat you is you yourself. That’s not really the case with Barcia. Last year’s results in his rookie SX season: 3-18-5-1-3-4-3-1. This year as a sophomore: 1-2-2-2-1-2-2-1. So that’s 15 top fives in 16 career Lites races, an enviable record of consistency that any young rider—smooth, wild, consistent or crazy—would love to match. 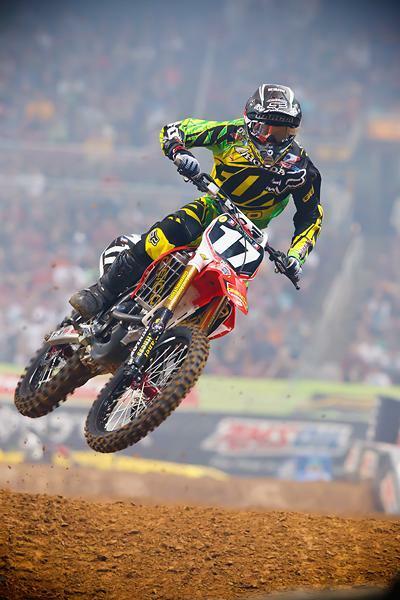 Barcia has been one of the most consistent Lites riders the past two years. And that one 18th came at the hands of Christophe Pourcel last year in Atlanta. Barcia was plowing into everyone in his heat race, and Pourcel got revenge on behalf of pretty much the entire class in the main event. Okay, we will give Barcia’s hard riding one mulligan, as his bad behavior earned him a spanking there. Otherwise, he’s been off the ground and on the podium a whole lot more often than not. It’s tempting to say that Barcia only learned to be consistent this year because he’s riding through the pain of a broken wrist, and maybe that injury has made him back it down a notch. But the stats show that while Barcia’s riding style may favor getting sideways, the results have always been pretty straightforward.